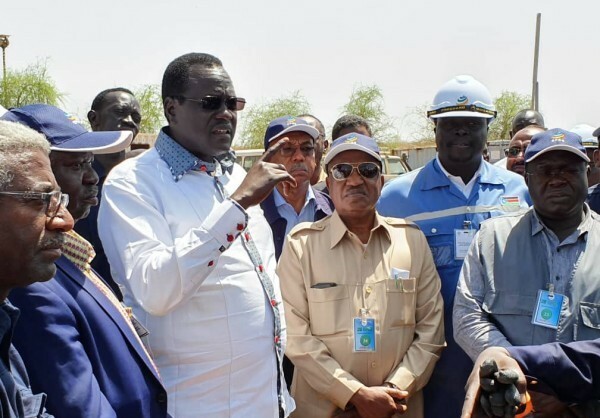 JUBA, South Sudan – South Sudan Minister of Petroleum has called for the continuation of oil industry collaboration between Sudan and South Sudan; work to resume production at Al-Nar, Al-Toor, Manga and Tharjath should continue to meet April 27 first oil deadline, says minister. Hon. Ezekiel Lol Gatkuoth said protection for oil workers on both sides of the border and flow of oil from South Sudan “shall remain uninterrupted”. Mr. Gatkuoth has called for continued collaboration in the oil industry between the two countries as Khartoum undergoes political turmoil. “The lifeline and the backbone of the economies of South Sudan and Sudan must continue to stand strong, in spite of significant political changes in the Republic of Sudan,” said the Minister. South Sudan exports all produced crude oil via pipeline from Hegleig and Paloch to Khartoum and then to Port Sudan for export. Since a landmark peace agreement in 2018, Sudan and South Sudan have collaborated to bring supplies and workers across the border to rehabilitate South Sudanese oilfields. The fields, damaged during and after the 2013 conflict, are now resuming production. “The economies and the people of Sudan and South Sudan share a common destiny. The flow of oil is vital for the people of both nations and shall remain uninterrupted,” said the Minister. The ongoing work at the Al-Nar, Al-Toor, Manga and Tharjiath oilfields should continue at the current speed in order to meet an April 27 deadline to pump first oil from rehabilitated wells. Oil workers are currently deployed inspecting oil flow along the pipeline route and will be protected along the length of the route, from oilfields to export terminal, and during transit, he added. South Sudan’s Blocks 3 and 7 are producing 134,000 barrels per day and Blocks 1,2, and 4 are producing 34,000 barrels per day of crude oil. The Republic of South Sudan today produces 168,000 barrels of oil per day.